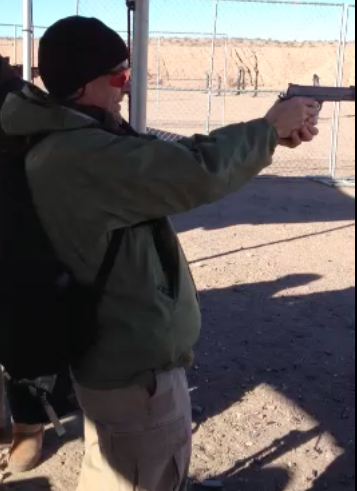 SHOT ShowMedia Day - On a cold as Hell frozen day over near Boulder City, NV, in the blowing wind and dust, I take aim with a $7,000 Cabot Guns 1911-style .45. Why so expensive? Think of benelli and other very high end shotguns. They are over-the-top in engineering, feel, accuracy and the beauty of the design and ornamentation. Has now ruined me for my S&W, M&P .45.OTOH, wouldn't want to drop this puppy in the mud or sand.